Christian Writer/Reader Connection: What Bugs Me About Reviewing Books? That is an interesting concept! Many times my book club members laugh with me when I point out nuances like POV, fact, or repetitive issues. But I still loved the story! Oh, yes, do incorporate that, and suggest it to Amazon, Goodreads, and B and N. As a reader, I'd like more choices than five stars. 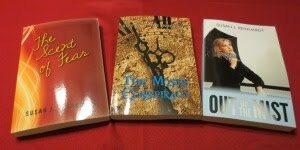 As an author, I'm often confused why someone gave my books four stars, then raved about how great they are! With your system, there would be more depth to a review.